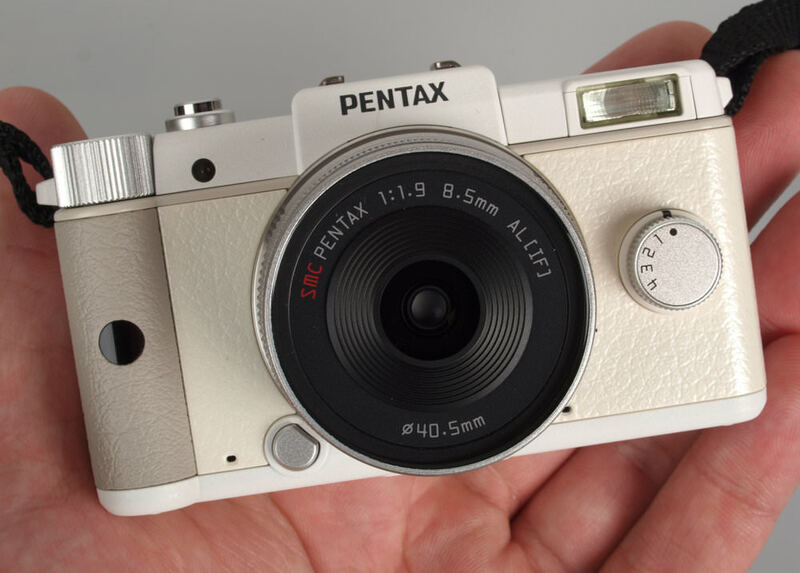 The new Pentax Q. Is small Beautiful? Martin Jordan finds out at the exclusive Jessops UK launch of the camera. Unlikely to be heard in a chemist, ‘Have you got the fruity, ribbed, glow in the dark, Pleasuremax in small?’ You see small is a pejorative term, it conjures up diminutive, inadequate, runty, stunted, meagre. In contrast, big suggests generous, immense, a whopper, humongous. When your girlfriend says size doesn’t matter... she’s lying. To avoid misinterpretation let me expand. In the world of enthusiast photographers the DSLR market has been dominated by the big beasts sold to us by the likes of Canon and Nikon. The presumption was if you want top quality, then you need a big heavy camera attached to a heavy thick piece of glass. Serious cameras for seriously butch men, guns not provided. The bigger the camera, the longer the lens, the more impressive you will be on those occasional EPZ meet ups. The bigger your tool, the better pictures you take right? Or will you just look like one? The thing is, whisper it quietly, small is the new big. I can suggest two reasons why, firstly the technology which seems to be leaping ahead, has enabled it. Secondly, relax guys, the ladies are demanding smaller. They want the features and flexibility but without having to ‘feel the burn’ carrying the bloody thing. They want small. Small enough to sling into a handbag without the bag falling to the ground like it’s got an anvil in it. Give it a few years, when you get your ‘big’ camera out, children will laugh and mums will nudge each other. You will be like the bloke who has just turned up at the beach, hands on hips, breathing in the sea air, holding in his belly... sporting a pair of budgie smugglers. 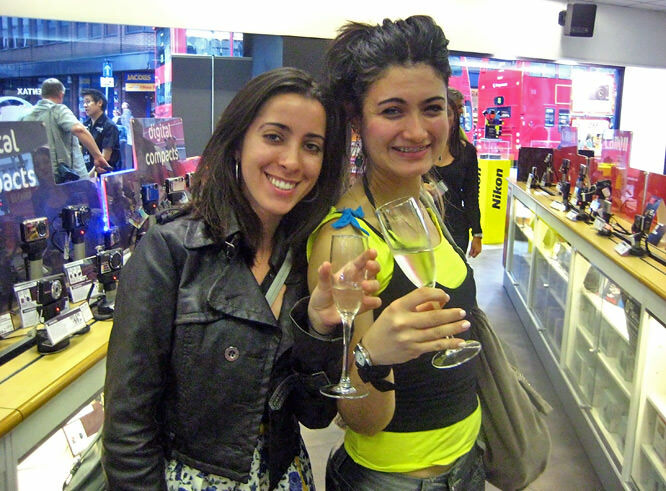 The launch was held at Jessop’s flagship store in London’s New Oxford Street, who have exclusive sales rights in the UK until November this year. The camera has been on sale for two weeks in Japan and has been selling like hot cakes. The invite was for 5-8pm, champagne and canapés, but interestingly they didn’t shut the shop. As I tucked into another mini curry on a mini poppadom (fitting for a mini camera launch), I asked the red headed waitress, how could she tell between the journalists, who obviously deserve champagne, and the riff raff walking in off the street? She replied she was told to serve everyone. Everyone?! It tickled me that a customer who had casually walked in, offered champagne and nibbles, might think that this was all part of the service. 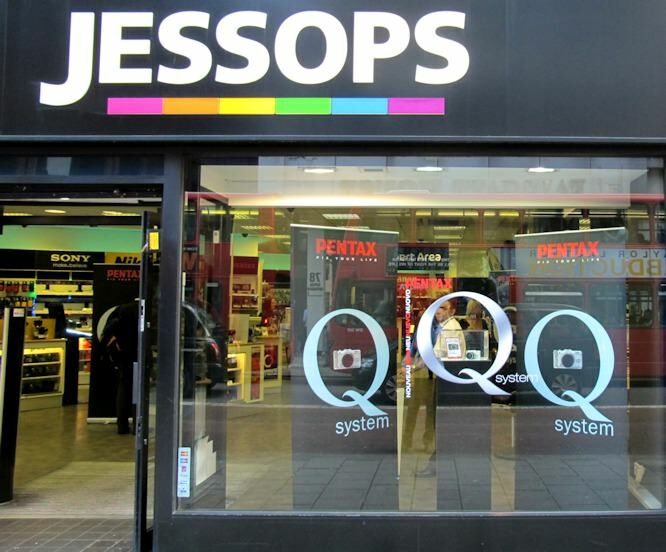 A cunning plan by Jessops to fight back at the internet - throw food and drink at them. It’s a good job no one galvanised a flash mob, to descend on the shop and scoff. It only takes one tweet. Enjoying the hospitality were a couple of charming Brazilian girls, both clutching glasses of poo, one of whom admitted she was ‘feeling a bit tipsy’. As her English was quite rudimentary, I was quite impressed with her use of the word ‘tipsy’. She had only come in for a memory card, and was now the proud owner of a new Canon G12. Maybe Jessops could be on to something here. I tried to explain to the girls that there was no such thing as a free lunch, but I think it was lost in translation. Saying adeus to the Brazilians I got back to the job in hand, checking out the Pentax Q. The unique selling point of this camera is not difficult to spot, it’s tiny and light as a feather. It will easy fit into your trouser pocket, but as the lens doesn’t retract like a compact, you will have a bulge in said pocket... better off in your handbag or jacket pocket. This camera is very nicely balanced, small but perfectly formed, the lens is in proportion to the body, unlike say the Sony NEX. I like the retro styling which seems very now, and you can choose from lots of funky colours as long as they are black or white. The sensor is 12.4 megapixels, CMOS type which is back lit for extra sensitivity (steady). You can choose from five lenses, the main two being the standard prime 47 mm and the standard Zoom 27 – 83mm. The camera comes in two packages, Jessops will sell you a body with prime lens for £600 and body with both lenses at £729. The camera is packed with features like HD video, shake reduction, a supersonic vibration mechanism to see off dust, HDR in camera and five fps continuous shooting. The flash is worth a mention, because the camera is so small, it has to distance itself from the lens. So it extends on an arm, not unlike ET’s finger, great for getting the kids to look at the camera. I asked Paul the Pentax man about some issues that I thought the camera might have. Firstly the sensor is tiny compared to even the mirrorless competition, let alone a full frame DSLR. How does it maintain the quality? Paul put this down to the sensor being backlit, that helps the small sensor cope. I suggest you read Josh’s review to find out how the quality of the images compares. Secondly, as the sensor is so small would the creative use of DOF be difficult? He said that to over come this, the camera had a bokeh button, that when switched on, makes the background blurred, just like using a large aperture. I really like the idea that small is beautiful, and I’m sure it’s the way forward. A small camera that has all the convenience of a compact, but all the versatility and control of a DSLR, sounds ideal. With this camera, the jury is out on the quality of the images, we need to test. But even assuming they are very good, a proper SLR has loads of lens for every occasion and five won’t do it. The longest lens being only a 100mm, what about sports, wildlife? Surely that’s the whole point of interchangeable lens; you stick on the lens for the job. With the limited range of lenses as they are, I think I would rather have a bridge camera with a large zoom which is retractable so will fit in your pocket, and no need to carry any other lens. I have to confess I have a big camera, but I have a feeling in the future my camera will be lighter and smaller and more usable. The Pentax Q is a step in the right direction, but for me right now, it needs the development of a bigger sensor and more lenses. And remember next time you are in Jessops and a cool red head offers you a glass of champagne, hang on to your wallet. 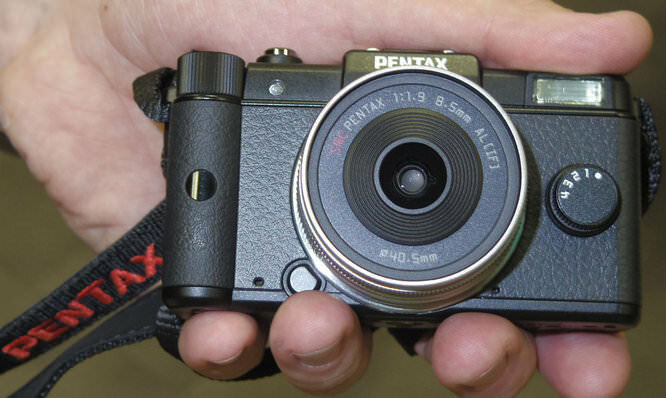 Read our Full Review of the Pentax Q here. Great article Martin. Just the right balance of humour and fact!